Protect your indoor air quality with expert acoustic ceiling removal in Rancho Cucamonga CA. If your home or business was built before the 1970s–and hasn’t been renovated since–it’s possible that your acoustic ceilings contain asbestos. Fortunately, there is a simple solution to this problem: acoustic ceiling removal in Rancho Cucamonga CA from AQHI Inc. We’ll eliminate that health risk that has been literally hanging over your head. Asbestos-containing materials will only present an active health risk if they become damaged, because this is when they will release asbestos fibers. These fibers can lodge in the lungs, causing serious, even deadly health problems with sufficient exposure. With the source of the fibers being located overhead in an acoustic ceiling, contamination can quickly spread to other areas of the building, since the fibers start out airborne and will stay afloat for days, drifting on air currents. Acoustic ceiling removal in Rancho Cucamonga CA helps prevent contamination by removing the materials that could release asbestos fibers. However, this is only true if you use the right asbestos removal company. Unfortunately, inexperienced individuals often make contamination worse by using incorrect asbestos removal methods that result in lots of dust being created, and then failing to thoroughly clean the area to remove this dust after work is finished. 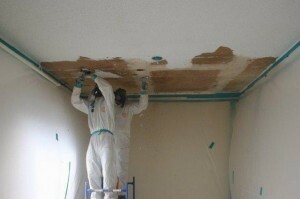 At AQHI Inc., we have over 20 years of experience providing acoustic ceiling removal in Rancho Cucamonga CA as a licensed and certified asbestos contractor. We are also fully insured with both workers comp and liability insurance, and we train our employees thoroughly to make sure every job gets done to a high standard. Whether you need help taking an acoustic ceiling out of one room in your home, or have a huge project involving an entire commercial building, we can get the job done right. Our asbestos removal office for Acoustic Ceiling Removal in Rancho Cucamonga CA is open Monday through Friday between 8:00 AM and 5:00 PM and closed for lunch from noon to 1:00 PM. With advance notice, projects can be scheduled for weekends, early mornings and evenings.